Today was our last day of Poland and there was no time to waste! Time for more driving. This was one of my favorite snacks of the whole trip. I didn't even know what this was when I saw it on a Polish products shelf at the supermarket. It's gingerbread! Like the best gingerbread ever. The stuff you get in the US is usually more like a cracker, but this was much more like actual bread. The pierniki is a famous product of the Polish city of Toruń where it has been produced since the Middle Ages. We said goodbye to beautiful Warsaw and headed back out into the Polish countryside. This would really save people a lot of time in the US. We were driving through the town of Myszyniec when the Collegiate Church of the Most Holy Trinity caught my eye so we made an unscheduled stop. This is why road trips are awesome. Many of the church buildings in Poland have had this style with the round things on top which reminds me of gingerbread houses for some reason. Maybe if there was more gingerbread I would go to church. That's on you, church. This was our last day in Poland, which meant the chance I would eat some Polish pierogi was quickly approaching zero. Not on my watch! We strolled the little town's main street popping our heads into restaurants until we found a winner. It seemed to have a lot of more traditional fare. At least I think it did. I couldn't read the menu at Karczma Marysieńka and there were no pictures. It worked out though because "pierogi" and "kielbasa" were both the only words I could read and the only things I wanted to eat. The waitress did not speak English but she did speak "O N E. B E E R." so that rounded out a nice meal. I got an order of meaty pierogi and an order of pierogi ruskie which are potato and cheese filled. The time I was able to use the word "ruskie" in serious conversation will surely become a treasured memory. "I'll have the kielbasa blah blah please." We were the only people in the place. I assume that's because... the food is so good that... they... always run out? That just meant we had plenty of space to admire all of their folksy tchotchkes. "I wear a colorful hat to indicate that I am folksy. Yes, I see that. I honor your folksy colorful hat." I bought way way too much food but as this was our last Polish hurrah I had to take emergency measures. The kielbasa were sliced up and nicely fried with some onions. Tell you what, fry these babies and sprinkle some parmesan on top and you'd have yourself a decent toasted ravioli. Our last stop was deep in the Polish woodlands. The perfect place to hide a Hitler. I'm going to steal some Wikipedia because I am a bad man. Wolf's Lair (German: Wolfsschanze; Polish: Wilczy Szaniec) was Adolf Hitler's first Eastern Front military headquarters in World War II. The complex, which became one of several Führerhauptquartiere (Führer Headquarters) in various parts of eastern Europe, was built for the start of Operation Barbarossa – the invasion of the Soviet Union – in 1941. It was constructed by Organisation Todt. The top secret, high security site was in the Masurian woods about 8 km (5.0 mi) east of the small East Prussian town of Rastenburg (now in Gierłoż, Kętrzyn County, Poland). Three security zones surrounded the central complex where the Führer's bunker was located. These were guarded by personnel from the SS Reichssicherheitsdienst and the Wehrmacht's armoured Führerbegleitbrigade. Despite the security, the most notable assassination attempt against Hitler was made at the Wolf's Lair on 20 July 1944. Hitler first arrived at the headquarters on 23 June 1941. In total, he spent more than 800 days at the Wolfsschanze during a 3½-year period until his final departure on 20 November 1944. In mid-1944, work began to enlarge and reinforce many of the Wolf's Lair original buildings. The work was never completed because of the rapid advance of the Red Army during the Baltic Offensive in late 1944. On 25 January 1945, the complex was blown up and abandoned 48 hours before the arrival of Soviet forces. There were lots of signs about staying on the path because of the danger of undiscovered mines that may still exist. I thought they were probably being dramatic but I guess you can never really be 100% sure you found all the mines. I have pretty extensive minesweeper experience from high school math class so I wasn't real worried. Even the parking lot was awesome. It was studded with bunker ruins. Similar to the end of the line at Auschwitz, the retreating Germans tried their best to blow the place up. I say "did their best" because there's still a whole lot of bunkers left pretty intact. And that's after 70 years of nature chewing on them. This one belonged to Hitler's private secretary, Martin Bormann. I imagine Hitler was like "make me a bunch of unexploadable wunderbar bunkers" and they were all like "yah mein fuhrer". Then a couple years later Hitler was like "we're retreating, so now I'm gonna need you to explodieren all those bunkers" and they were like "well crap." I'm not going to lie. I had my eye open for a brick or a piece of bent rebar as a souvenir. I didn't end up taking anything though. You win this time, Hitler! I believe this was a memorial to the assassination attempt on Hitler that took place here dramatized by Tom Cruise in the film Valkyrie. There were lots of warnings to stay out of the buildings. I mostly ignored them. Hitler's Bunker. Hitler's architect Albert Speer described the building as "an ancient Egyptian tomb. It was actually nothing but a windowless block of concrete, without direct ventilation, in cross section a building whose masses of concrete far exceeded the usable cubic feet of space." It was a pretty serene place to contemplate a world war. Then it was back on the road again. 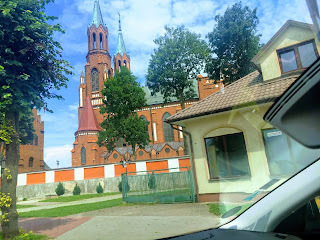 It was time to leave Poland and cross into Vilnius, Lithuania. Crossing the border was a bit of an experiment because after we booked the rental with Europcar we realized that Lithuania, Latvia, and Estonia were all excluded from our rental agreement. I half expected the car to shut off or an alarm to sound as we crossed into forbidden territory. It turned out that these three countries were probably banned for good reason. The roads were really really bad. We stopped at a gas station just on the Poland side of the border to spend the remainder of our zloty. The attendant was amused by the smaller and smaller things we put on our pile of junk food in order to get rid of the last of the money. A tip to him finished off the rest. On to Lithuania! There was a serious amount of construction. The road situation delayed us so much that we didn't reach Vilnius, Lithuania until the middle of the night. Finding dinner was a bit of a trick because so many places were closed. The delay had effectively eaten our time in Lithuania, as we were moving on in the morning. Oh well. We enjoyed it while we could. You can see the #LT100 hashtag there which refers to this being the 100th anniversary of the signing of Lithuania's Act of Independence. We stumbled upon a really legit looking pub called Amatininkų Užeiga, and we quickly went to work ordering the most Lithuanian food we could find. From the "beer snacks" section of menu I ordered "fried bread with cheese" seen here in the center. They were fun because they were just strips of dark rye bread fried and dipped in cheese. When I washed a couple of those down with a beer I could feel myself getting healthier, lifespan lengthening. I'll let you guess which of the two of us ordered the other two dishes. To the left we got the "Herring. Traditional Lithuanian dish with hot potatoes, onions, and sour cream". To the right was "Cottage Cheese Pancakes (Varškėčiai). Baked with strawberry sauce or boiled with butter sauce." So Lithuania recap: 100 years, fried breadsticks. Got it covered. Next country!